aridhu Am – is rare. 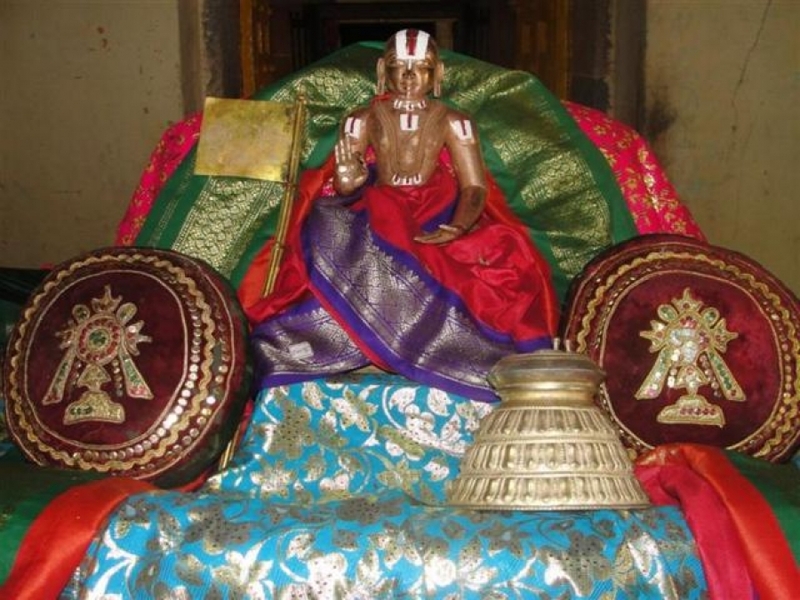 He (maNavALa mAmunigAL) divined in the last two pAsurams about how due to gratitude and due to love towards services to AchAryan would not let a disciple stay away from AchAryan; he divines in this pAsuram that by the relationship formed due to the aforementioned, how they take care of svarUpam and divine body respectively, and that even though this meaning is heard, doing that in practice is difficult to achieve. AchAryan chichchan Aruyiraip pENumavan – AchAryan is – for the disciple to reach true goal, since he reforms the disciple to be in good ways which he does by way of giving knowledge, he by his advice is attentive at all times for protecting without any damage, the true nature of the disciple who got his blessings. Such is AchAryan. thEsArum chichchan avan seer vadivai Asaiyudan nOkkumavan – Disciple is – one having the light of knowledge about true nature of self, based on training by AchAryan, and as said in ‘AchAryanaik kaNdAL pasiyan sORRaik kaNdARpolEyum [SrI vachana bhUshaNam – 244]’ (~when seeing AchAryan disciple should think like how a very hungry person does upon seeing food), and having AchAryan as his life support, nourishment, and enjoyment (thArakam, bhOshakam, bhOgyam) and everything, and since this is AchAryan’s final divine body which is very much liked by sarvESvaran, doing services to that auspicious divine body of AchAryan in suitable ways and be alert at all times for that, and with love be protecting that in such ways. and as said in ‘ippadi idhu iruvarkkum vyavasthithamAy irukkum [? ]’ (in this way it would be the way for both of them in their respective ways), is how two AchAryas have divined. He too is being with disciple like said in ‘snigdhOhitha parassadhA’ (should always be kind and wishing well). so the AthmA would be food and jewel to emperumAn. Arkkum annEr niRkai aridhAm – even for those who are greatly knowledgeable, being enthusiastic about this rare conduct is rare. It is as said in ‘adhu sAla arumai uNdu’ (~ there is a lot of rarity in this). kEttu vaiththum Arkkum annEr niRkai aridhAm – What is sweet to the ears can be heard and enjoyed is all there is to it; even for the knowledgeable ones who have knowledge of ‘I’ (about self), it is rare for them to follow in action the ways that are said in it. So, what can be achieved without any effort by the grace of AchAryan, is rare to achieve through one’s own efforts. This entry was posted in Other, upadhESa raththina mAlai and tagged 74, acharyan, annan, chichan, chichchan, disciple, erumbi, erumbiappa, kovil, mamunigal, manavala, pasurams, rathina, rathinamalai, raththina, raththinamalai, sishyan, upadesa, upadhesa on February 6, 2016 by raghuram. pEsu – You find this and let me know. He (maNavALa mAmunigaL) says that if one thinks about the help of AchAryan as explained in the previous pAsuram, there is no reason for separating from him. If one realizes the service to be done to the true goal that is AchAryan, then too there is no reason for separating from him. 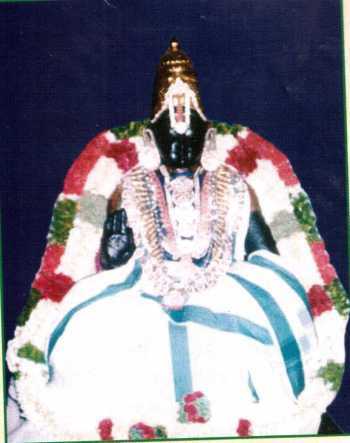 than Ariyanukkuth thAn adimai seyvadhu – That is, like feeding one’s mother and taking care of her (which is natural for the child), for AchAryan who is one’s own chief, be a disciple that belongs only to him, and reach one’s goal doing kainkaryam as per one’s true nature, which is, thinking that doing kainkaryam and worshiping him is one’s life support, nourishment, and enjoyment (thArakam, bhOshakam, bhOgyam). avan innAdu thannil irukkum nAL – It is during this time in this earth where due to emperumAn’s wish this AchAryan has incarnated with this divine body, that one should do kainkaryams. 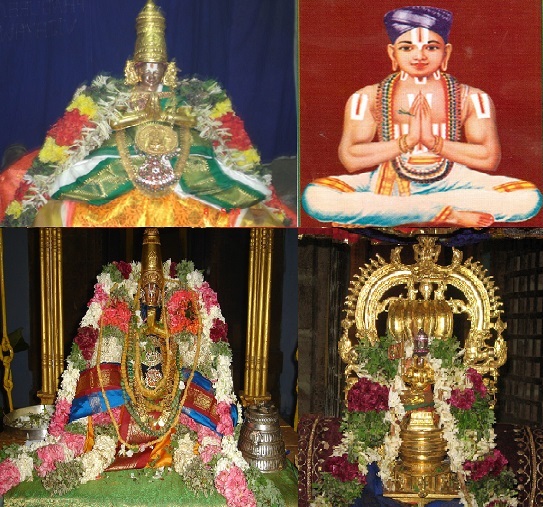 In paramapadham everyone would be immersed in the experience and kainkaryams to emperumAn who is the head of nithyasUris who are ‘ayarvaRum amarargaL [thiruvAimozhi – 1.1.1]’ (nithyasUris who do not forget), and would go deeper into that. So, when one is needed to live with support of other things in this world – in such a world when AchAryan is present, when AchAryan gets the kainkaryam by way of small things, and by the faculties of one’s body. It is said, ‘ney amar innadisil nichchal pAlodu mEveerO [thiruvAimozhi 6.8.2]’ (would you be around me and eat the porridge of ghee, and with milk everyday), and ‘kurukkaLukku anukUlarAi [periyAzhvAr thirumozhi 4.4.2]’ (be amicable to do kainkaryam to AchAryan). If AchAryan ascends to the other world, whom will the disciple serve? nanjeeyar said ‘ennaip pOl vAypugum sORRaip paRi kodAdhE’ [Like me, who lost the rice which was ready to enter the mouth; nanjeeyar lost his AchAryan bhattar quite early in his life]. adhil Asai inRi – in such a way when having the AchArya kainkaryam that is set for you – but not having interest in it, and due to that reason, who would separate from him and live? AchAryas who have such a state where they would not live when not getting the experience of emperumAn even for a second – who among the dependents of an Acharyan would separate from AchAryan? There may be some who separate from him when not knowing the proper way, but among those who understand the proper ways, there would not be any one who would separate from him. Even if there are those who separate from Isvaran, it would be rare to see any knowledgeable one who separate from AchAryan. Who would sustain themselves when separating from AchAryan who make him realize the connection with emperumAn which, one had not realized from time immemorial, who created the taste of kainkaryam and accepted his kainkaryam by keeping him with him? Where to search for them? There is no one like that among those having intelligence. manamE pEsu – Oh mind which would not sustain by anything other than AchArya kainkaryam! If there are such people, you search and tell me if you can. His (maNavALa mAmunigaL’s) divine mind is like he said in ‘ethirAsA ennALum unthanakkE AtkoL ugandhu [Arththi prabandham – 11]’ (~ Oh yathirAja! Please accept me to be for you only always). So he says that there is none that his divine mind knows who would separate from AchAryan. This is what they divine as ‘pAdharEkAsamar pirigaiyAlE avaridaththil parivAlE thiruvuLLaththil parivu thORRa aruLichcheydhu aruLinadhu [? ]’ (due to the separation of one who is like the lines of the feet, due to love towards him he said this with such love). After that, it seems he said ‘endhai ethirAsA indhath thani iruppil enthAyanthannai ini neekkik kandhAdai aNNanaip pOl kaNkarichchal uNdAkki, vandhArenai nOkkuvAy [?]’. So, by this pAsuram it is said that those who are subservient to their AchAryan, that is those who consider their kainkaryam to AchAryan as their life support, nourishment, and enjoyment would not separate from him. This entry was posted in Other, upadhESa raththina mAlai and tagged 74, acharyan, adimai, annan, dhesantharam, erumbi, erumbiappa, kovil, mamunigal, manavala, pasurams, rathina, rathinamalai, raththina, raththinamalai, thesantharam, upadesa, upadhesa on February 5, 2016 by raghuram. iruththal – staying in that way in a place that is away from service to AchAryan? yAm aRiyOm – I don’t know of any. He (maNavALa mAmunigaL) divined in the previous three pAsurams about AchAryan’s nature of getting us to the shore (uththArakathvam). In this pAsuram, he is divining about AchAryan’s help (upakAram) that he did to us, starting with ‘AchAryan sey(dha) upakAram’. The big help of AchAryan who gave knowledge etc., and been giving protection – if this gets highlighted in individual minds, then mind of a disciple who is having gratitude would not be capable of living in a different place than the place of AchAryan. and so in these ways if one involves about the great help of AchAryan, if that gets highlighted in one’s mind in pure thoughts; saying ‘if’ here shows the rarity of having such gratitude. While it is common to see those not having gratitude, those having gratitude are rare to find. – ‘kUsAmal eppozhudum kURu [Arththi prabandham – 45]’ (say that (the aforementioned) about our AchAryan without shyness and pride). Now, He (maNavALa mAmunigaL) says that, in this way the mind of these people who have seen the help of AchAryan would not wish to stay in a place different from that of AchAryan. thEsAntharaththil irukka manam thAn porundha mAttAdhu – That is, the mind which expects to give something in return for the help received, would not be fit in a place different from that of AchAryan, for the reason of interest in things, interest in living in a place, etc. Even if they liked to be there somewhere else, their mind would not find it fit to stay in such places, as said in ‘ninnidaiyEn allEn enRu neengi [thiruvAimozhi – 8.2.10]’ (My mind leaves saying that I am not a part of you), it would leave them and be ‘mundhuRRa nenju [periya thiruvanthAdhi – 1]’ (Oh mind! which is more eager than me), such is the mind that sets to avoid being somewhere else as said in ‘pOndhadhu en nenju [rAmAnusa nURRanthAdhi – 100]’ (my mind got fixed onto your divine feet). So, as said in ‘upakAra smruthiyAlE sahavAsam sidhdhikkum [SrI vachana bhUshaNam – 325]’ (due to the disciple’s thoughts of gratitude, AchAryan would get his company), the mind of those who stay together with him and stay under the sight of him (AchAryan), would not be able to tolerate the separation. Those having such mindset are those like nanjeeyar, dheivavAri ANdAn (look for his divine name in this link: AlavandhAr), et al. with such ingratitude which is ‘nishkruthi illAdha pApam’ (sin that does not have a requital / parikAram), without knowing that, being separated and being immersed in that state – don’t know the reason for this. Only the minds of those who are separate from AchAryan would know the reason. ini EdhaRiyOm – After this is the state of the meanings, is there some who knows the reason (for the separation) and can tell us that. Since he (maNavALa mAmunigaL) is ignorant when it comes to knowing the mistakes of others, he is saying ‘ini EdhaRiyOm’. Without going according to the words of SAsthram – ‘nithyam gurumupAseetha’ (should meditate about guru every day), and without going according to the words of AchAryan ‘sadhAchAryan kaN vattam vittAl, nithya samsAriyAyE pOmiththanai’ (If stayed away from the sight of AchAryan, one would eternally stay in the cycle of being born in this material world) – such people’s conduct is beyond comprehension of knowledgeable ones. yAm EdhaRiyOm – Having the conduct of being under the shadow of AchAryan, budding and blossoming of svarUpam – instead, having the heart of opposite conduct – do not know to find and tell you the reason for that. I do not ‘know’ that. So even for him (maNavALa mAmunigaL) who is full of all knowledge, this contradictory conduct is beyond knowing. 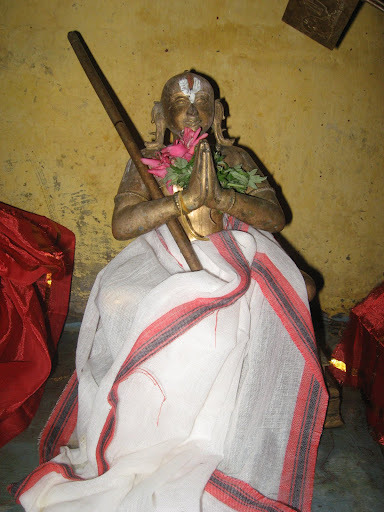 a confidante sishyai (woman disciple) of nanjeeyar heard this and said to that person for not being anguished for going away, ‘What did you say piLLAi (child)! Here you think about the story divined in the vyAkyAnam of ‘EnaththuruvAy ulagidandha UzhiyAn pAdham nALum maruvadhArkku uNdAmO vAn [mudhal thiruvanthAdhi – 91]’ (One who does not surrender to the divine feet of emperumAn – would they get SrIvaikuNtam?) (If such is the case for emperumAn, it goes without saying in the case for AchAryan – is the implication here). This entry was posted in Other, upadhESa raththina mAlai and tagged 74, acharyan, annan, dhesantharam, erumbi, erumbiappa, kovil, mamunigal, manam, manavala, pasurams, rathina, rathinamalai, raththina, raththinamalai, upadesa, upadhesa, upakar, upkar on February 4, 2016 by raghuram.